A proud person looks upon everything as mean and servile; he sees all supremacy and pride in himself, so he looks down on everybody, asa king looks upon his subjects. Perfect and absolute pride can only beattributed to Allah. The Prophet, Allah’s Prayers and Peace be upon him, says, “Allah says: Pride is My Wear, Supremacy is My Dress, I will break anyone who vies with Me for them and I do not care” (Hadith). 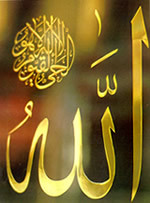 Glory be to the One who rightfully deserves to be called the Most PROUD, He is Allah.